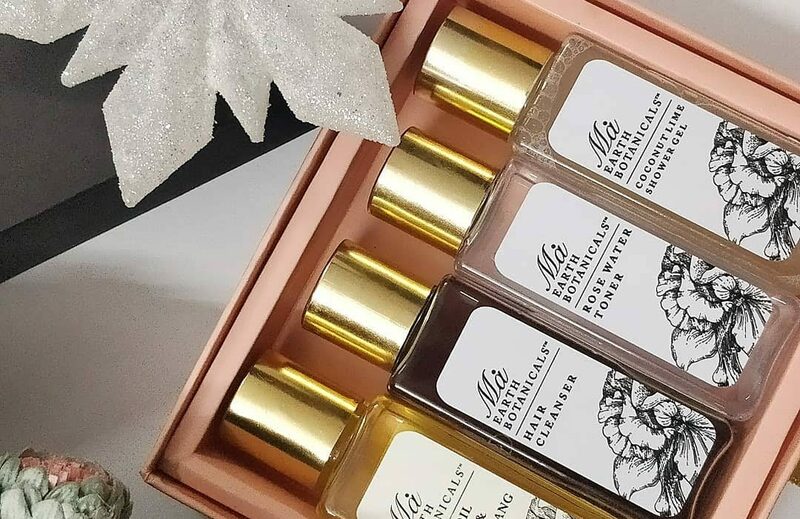 When it comes to skincare and other bath and body luxuries – I am extremely choosy and I tend to look out for the options that are free from parabens and other harmful chemicals etc. I always love organic skincare products. 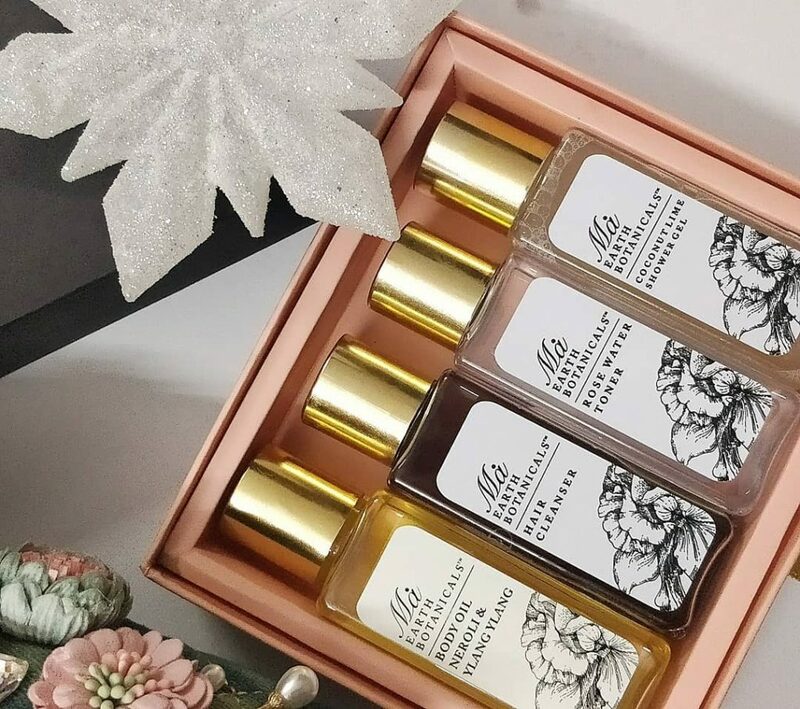 For holiday 2017, I was given this Travel Gift Set by the wonderful Ma Earth Botanicals team and I must say that I am super impressed with their products. 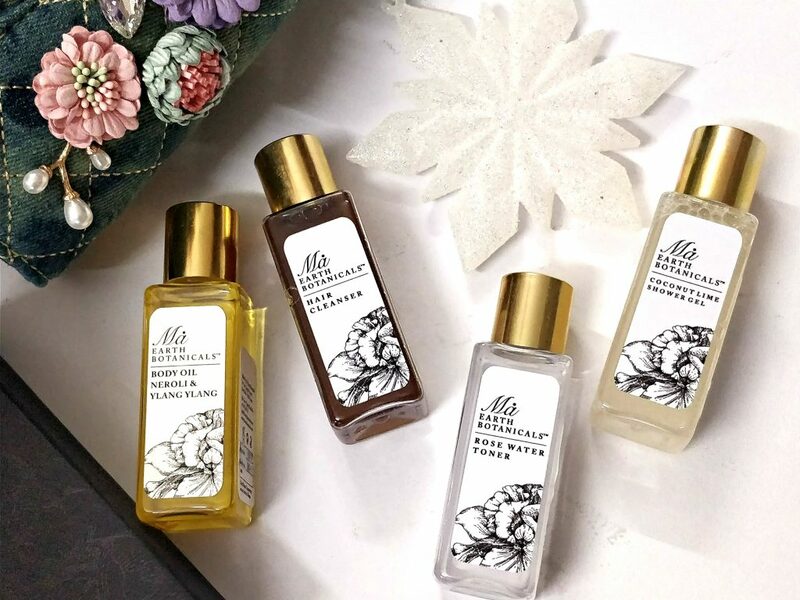 Established in 2013, Ma Earth Botanicals is a skincare and haircare organisation based in New Delhi, INDIA handcrafting a luxury line of products using pure aromatherapy oils and the natural blessings of Mother Earth. 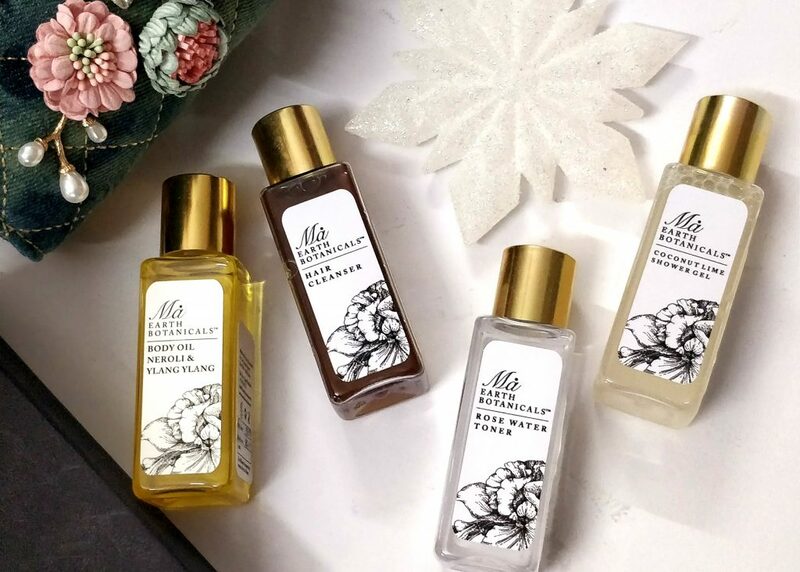 All of their products are handcrafted and contain no artificial ingredients, chemical preservatives, synthetic additives, artificial fragrances, SLES, parabens and sulphates. Made using highest quality 100% pure essential oils, sustainably sourced vegetable oils and unrefined butters that are cold pressed to preserve their natural goodness and healing properties. None of Ma’s products are tested on fellow animals. This travel box retails for INR 975 and is a great discover set to gift to yourself or your loved one. The packaging is quite fancy. The beautiful pet bottle with the golden lid adds beauty to it. 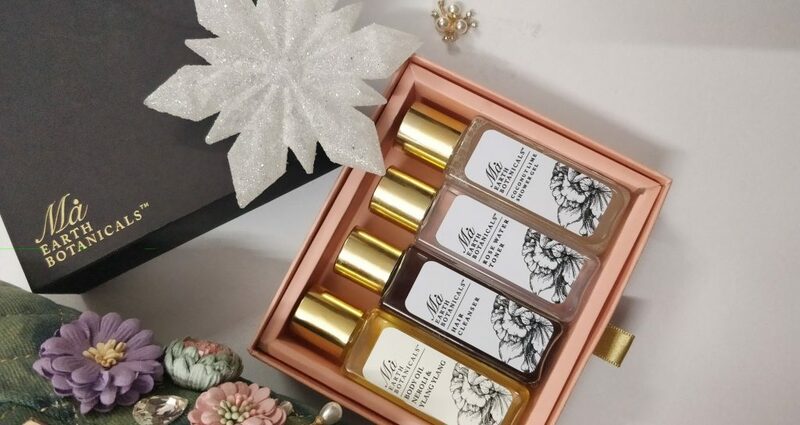 First thing that I noticed is how pretty that gift packaging is. With a Peach+Black gift box, The overall set is a minimalist design. I so love the aroma of this one. It’s so relaxing and uplifts your mood instantly. I love the warming notes of Ylang Ylang that lasts the whole day. The oil is not greasy. It absorbs pretty quick and the fragrance feel very natural. Not overpowering. As you can read from the ingredients – It’s a beautiful mix of several oils along with essential oils Neroli and Ylang Ylang. Hair Cleanser – INR 975 for 7.7 fl.oz/230 ml is a gentle shampoo. It has a Sulphate-free formulation that is perfect for all types of hair. It’s a unique blend of natural herbs and oils which deeply clean and nourish the scalp. Ritha promotes hair growth, softens hair and removes excess oil. Bhringraj helps strengthen hair and encourage hair growth. Shikakai gently cleans and strengthens hair. Jojoba oil is the only oil whose molecular structure is similar to sebum and hence it helps maintain the scalp’s natural balance. It also adds shine, elasticity and softness to hair. Rosemary helps stimulate hair roots and encourage hair growth, it is also know for its stress relieving properties. Cedarwood and Thyme are well-known for their strong anti-bacterial qualities and help promote hair growth. To use this product, You have to mix one capful of hair cleanser in one capful of half cup water and massage lightly onto wet hair. Continue to massage for one-two minutes. Rinse well and follow with conditioner. I like it as a everyday shampoo. As I have a medium thick hair- I got about 4 washes from this 50 ml bottle. I like the smell of this one. Because of it’s mix of medicinal ingredients – I find it smelling as natural ever! The mix of Reetha, Shiakai, Amla etc. Very natural. It’s a gel like shampoo and It doesn’t lather much like the commercial shampoo. But, does pretty good job in cleansing the scalp and taking away all dirt etc. Hair felt bouncy, soft and it gave good volume to hair after washing which I really liked. I felt my scalp clean. NO itchiness or any hair fall issues etc. Rose Water Toner – INR 775 for 7.7 fl.oz/230 ml of product is a steam distilled, gentle and natural alcohol-free Rose Water, helps calm, refresh and balance all skin types. Brand claims that it helps hydrate skin, tighten pores and remove surface impurities without drying the skin. Especially beneficial in polluted and humid environments. All you need is spritz onto face after cleaning or just to refresh anytime during the day or night. I like how natural this one is. There is no overpowering smell or any colorants or fragrances or other harmful chemicals added to this. It didn’t irritate my sensitive skin. I used it right after cleansing. I soaked a cotton pad in this and swiped it all over my face. it feels very fresh when using this. Love it. Coconut Lime Shower Gel – INR 1450 for 16.9 fl.oz/500 ml is a mild body wash which is Sulphate-free and suits all skin types. Free from SLES, Parabens and Petrochemicals, this gel is especially formulated to gently cleanse, moisturize and rejuvenate skin without stripping its natural oils. It’s a perfect tropical summer shower gel. Coconut oil naturally high in fatty acids and proteins, helps keep skin smooth and retain the moisture content of skin. Lime essential oil has an invigorating and stimulating effect on the senses. Vegetable based Glycerin naturally hydrates and rejuvenated skin. It’s not a best product in my opinion. I Think the ingredient list has non natural items as well. Consistency of the product is gel like, little runny in consistency and it lathers pretty well. The refreshing citrusy note instantly uplifts your mood too! Scent doesn’t linger for long. But, it’s very refreshing when using it. It cleanses the skin very well and at the same time leaves the skin supple and soft. For winters, You will need a extra layer of moisture for your body. 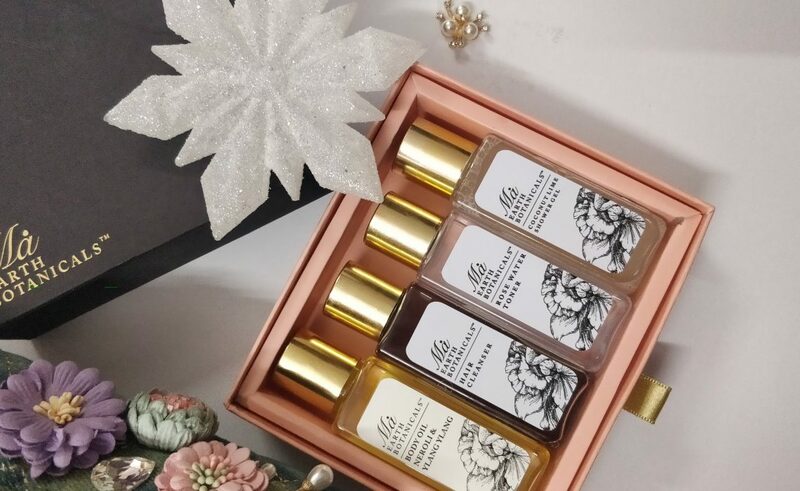 Overall, This gift set along with others here are a perfect gift choice to your mom, sister or loved one. 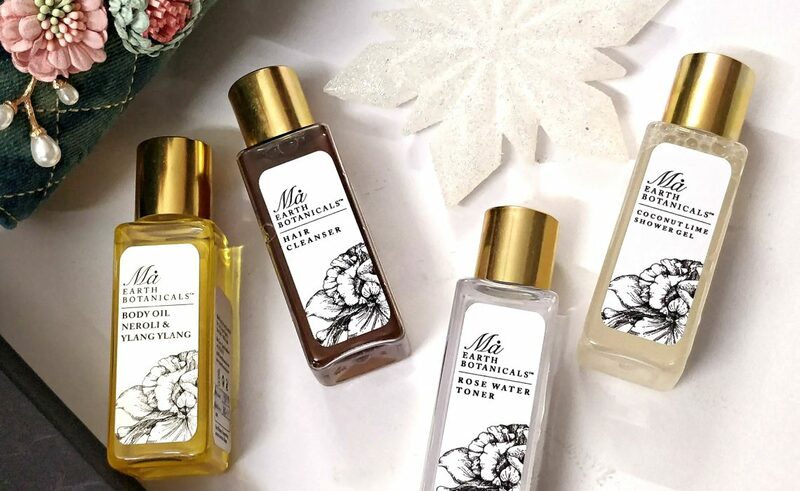 If you are into organic skincare and bath and body products, You can definitely give this brand a try.